This option allows you to create forms to update, on a single screen, tables with 1:N relationship. In the application menu, you can create a new connection by clicking on the “New detail” option from Master/detail folder. Interface to set link name and label. 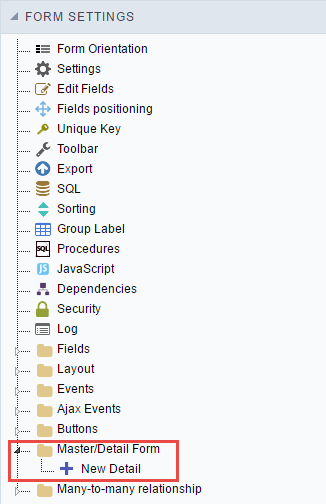 It is going to be displayed within the master application as a field. Name can not contain spaces nether special characters. Interface to set link name and label. 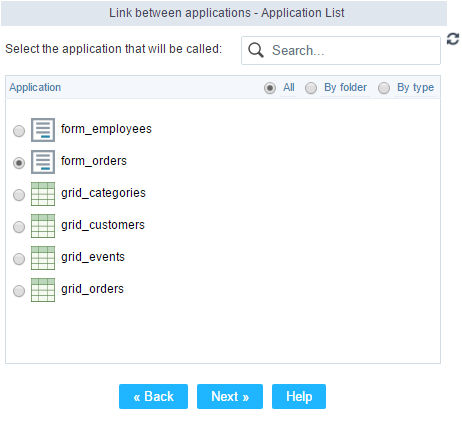 Only the form types: Editable Grid or Editable Grid View can be used as an application detail. You must create the form detail application before you create the Master/Detail link, because you will need to select the application during the link creation. Interface to configure the detail application. In the left side column will be displayed all master form fields, and on the right side column are listed the detail form fields. You will need to associate the master form primary keys with the detail form foreign keys. The 1:N relationship between the tables must to exist also within the database. 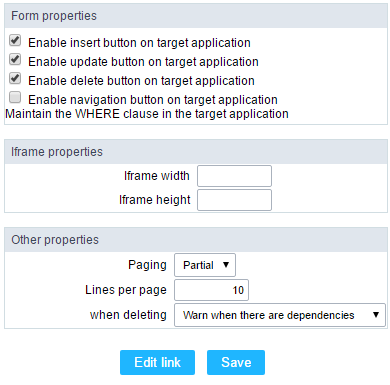 Interface to configure the link parameters. After the link creation, you can change the properties by clicking on the link and selecting the properties option. Form properties : Within this option you can select the buttons that are going to be displayed in the detail form. Iframe properties : This option allows you to configure the iframe height and width (in pixels) where the detail form is going to be displayed. Editable Grid View : Allows you to select if the detail form will be an Editable Grid view or not. Total : This option will set the page to display all records in one page. Lines per page : Here you can set the amount of records that are displayed in the detail form, you will need to set that just if paging is partial. Warn when there are dependencies : Displays an error message if there is dependency on the detail form record that is being deleted from the master form. Delete dependencies without warning : Deletes all existing dependencies in the detail form without warning the user. Edit link : This button will allow you to remake the link for application details.